August 14, 2013: Former UConn researcher Dipak Das, who was found to have committed misconduct, submits a paper to Oxidative Medicine and Cellular Longevity. September 19, 2013: Das dies. October 17, 2013: Das submits revisions to his paper in Oxidative Medicine and Cellular Longevity. October 18, 2013: Paper accepted. January 12, 2014: Paper published. The paper also lists Das’s affiliation as UConn, despite the fact that he was fired from his post there in 2012. We’ve emailed the Das email address to ask whomever’s monitoring it for details, and have tried to contact the academic editor for the paper, and the journal’s publisher, Hindawi. We’ll update with anything we learn. Please note that manuscript titled “Antiaging Properties of a Grape-Derived Antioxidant Are Regulated by Mitochondrial Balance of Fusion and Fission Leading to Mitophagy Triggered by a Signaling Network of Sirt1-Sirt3-Foxo3-PINK1-PARKIN” was submitted on August, 14 2013 and Dr. Dipak K. Das has already approved manuscript’s submission, and he has a contribution in scientific content of the paper. 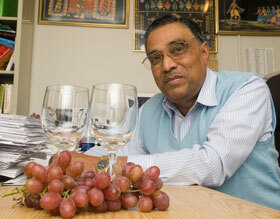 We are aware that Dr. Das died on September 19, 2013. However, since he has contributed to the scientific content of the manuscript his name should have been kept in the authors’ list, and the final version has been approved by other participating authors of the manuscript. Micheal Jackson is releasing a new album, and with Tupac is alive and releasing albums. Perhaps he’ll be giving hologram talks at conferences soon. I am not quite sure what the mystery is (frankly, I find the headline a bit disrespectful, but that seems to be on par for the recent work of the headline editor). The paper was revised by the remaining authors and they obviously forgot to alert the Journal about Das’s death. Also notice how reference  and  are the same, as are reference  and  (sloppy authors and sloppy editorial work). If I am a non-expert, and I detected this many errors in about a 15-minute analysis, how could the editors of this journal and publisher, not pick up n such basic issues? Right, I forgot, solid “peer review”! The web-site (http://www.hindawi.com/journals/omcl/) states: “Oxidative Medicine and Cellular Longevity is a unique peer-reviewed journal…” The key information is this: IF = 3.393 and “Oxidative Medicine and Cellular Longevity currently has an acceptance rate of 56%. The average time between submission and final decision is 57 days and the average time between acceptance and final publication is 39 days.” Translated, rush jobs meant to game and milk the IF for profits will always result in problems. Not unlike the Das case, I wish to go public about one case that remains intact, in the literature, despite the blatant duplication, and publish the e-mail sent on March 12, 2014, also copied to RW*. It involves two papers by an extremely highly respected horticultural scientist, Prof. Abraham H. Alevy, who passed away a few years ago, but who has left behind at least one serious case of duplication. My e-mail to the authorities, namely to the 28 colleagues at The Hebrew University of Jerusalem, The Robert H. Smith Institute of Plant Sciences and Genetics in Agriculture, remains unanswered. The duplicate paper remains intact, without any correction, erratum, notice of duplication, or, most importantly, without any retraction. Below, the e-mail that was sent, as a formal complaint to the university where Prof. Alevy worked, requesting the university authorities to take the initiative of correcting the literature in the light of his passing away. I hope that they do the right thing to restore the integrity of a colleague who has passed away. Duplication is a serious academic offense*. I wish to report my concern about two papers (files available upon request) that duplicate text of approximately 60-70% of the paper content. The author is Prof. Abraham H. Halevy, who is now deceased. This case should be reported to the person in charge of the academic affairs of Acta Horticulturae, Prof. Yves Desjardins (e-mails redacted), who had already formally indicated that duplicate papers will be retracted and that the ISHS will follow the highest international standards of publishing ethics. The example of Prof. Johan Van Huylenbroeck and Dr. Tom Eeckhaut, who responsibly retracted their duplicated paper from Acta Horticulturae (http://www.actahort.org/books/961/961_15.htm), should be followed, and the initiative should come from you, Prof. Adam, as head of department, in this case where the author is now deceased. It is essential to correct the literature and remove redundant information to ensure the academic and scientific integrity of the horticultural literature. A second concern involves the listing of only a few dozen papers on Prof. Halevy’s profile (http://www.huji.ac.il/dataj/controller/ihoker/MOP-STAFF_LINK?sno=750384&Save_t=horticulture) when in fact his site claims that he has published “Over 350 publications in international refereed journals.” Is there a particular reason for The Hebrew University of Jerusalem not providing a full list of these 350+ papers? I look forward to seeing the paper retracted soon. May I also recommend that the staff at your institute review its publication profiles and ensure that no additional duplicate publications exist as a wide-spread post-publication peer review of the plant (and horticultural) science literature is now in effect: http://journal.frontiersin.org/Journal/10.3389/fpls.2013.00485/full. The Hebrew University of Jerusalem has some extremely respectable plant scientists, current and emeriti, but the recent shocking discovery of this ethical infringement by one of the great leaders, Prof. Halevy, and other leading horticultural scientists from around the world, for example, Prof. Johan Van Huylenbroeck (http://www.actahort.org/books/961/961_15.htm), has not raised red flags and alarm bells that perhaps the horticultural and plant science literature is much more corrupted than has been led to believe. The author “to whom correspondence should be addressed” and the person handling the submission need not be identical. Of course it would have been better to give an e-mail address of a living person for future correspondence. I can’t help but be reminded of the Stanley Donen film “Charade,” specifically the funeral parlor scene, during which George Kennedy confirms the deceased status of Audrey Hepburn’s husband via judicious application of a straight pin. I’m just saying. Just another case that could have been rendered moot by verifying authorship with all authors just prior to publication. 1)The submitting author is responsible for ensuring that the article’s publication has been approved by all the other coauthors. This is a terrible policy. For $1500, you’d think they could at least send an automated message prior to publication. 2) The submitting author could not have possibly done this as one of the authors was not living. This should at least require a note to the editor… but assuming the editors were aware, I see no problem. (1) What is the gold standard – how to proceed, if the corresponding author passed away during revision? (2) Dear community, please tell me how to proceed in (a hypothetical) case of a meanwhile deceased senior author, who definitely made significant contributions towards a publication (in form of discussions, supervision, etc.) but never saw the final manuscript? He however would have seen the large majority of results in form of talks, posters, and within group meetings I suppose. Should he be listed as a coauthor? Should there be a special notice after his name? (3) The very same question applies – even harder to answer – if an author moves away and remains unreachable. E.g. assume a retired senior prof moving to an island who does not respond any more to any kind of communication and cannot be found in person. (4) And finally, assume a paper, where one of the senior authors supressed publication at all (on scientific reasons) and he then passes away (let’s say a year later or so). Would it be valid to publish the work then (without his name of course) if all the other authors would agree on the scientific validity? I’m curious! I hope this is the right place to discuss this subject. In particular, your question is perfectly valid because the ICMJE “guidelines” for authorship, based on which Elsevier Ltd, bases its entire journal fleet, states that all authors must have seen, and approved, the final draft before submission. Thus, by definition, deceased authors are invalid author, OR the submission is invalid. Guy is dead, right? Just leave him alone. It just gets to show you the kind of people who lurk around here. A bit disturbing. I would love it if so many people were paying such close attention to my work after I die. Next Next post: Does publicly questioning papers lead to more corrections and retractions?